Whatever happened to JELL-O pudding pops? 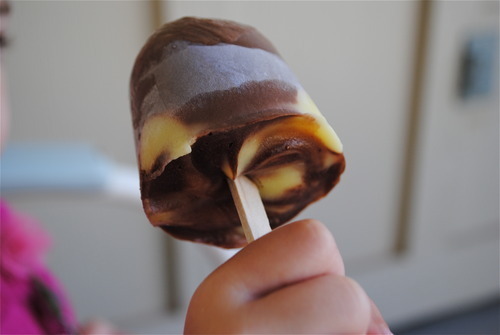 I loved those things….especially the chocolate-vanilla swirl. For this recipe I used chocolate and vanilla instant pudding, but you could use any flavors you prefer. I think banana would be fantastic. For these pops I used 3 oz. cups as my molds. You can find them in the paper products aisle. Before you make your puddings. Take a cupcake pan and place 12, 3 oz. cups in each of the cupcake molds. Set aside. In a medium bowl pour in 1 cup whole milk, 1 cup half&half, and vanilla instant pudding. With a hand mixer blend on high for a minute or two. Set aside. In another medium bowl mix the remaining cup of whole milk and cup of half&half, and the chocolate pudding. Blend on high for a minute. Now you are ready to pour the puddings into the 3 oz. cups. Try and work quickly or the pudding will set up and make it harder to pour. I like to alternate pouring between the chocolate and the vanilla to create a swirl affect. Also, dipping and gently stirring a butter knife after pouring will help create a better swirl affect. Make sure not to over-fill. The pudding will expand as it freezes. When you are done pouring in puddings, position a popsicle stick in the center. Try and avoid pushing it all the way to the bottom. Gently try your best to cover and wrap the cupcake tin with plastic-wrap. Allow to freeze for at least 4 hours. 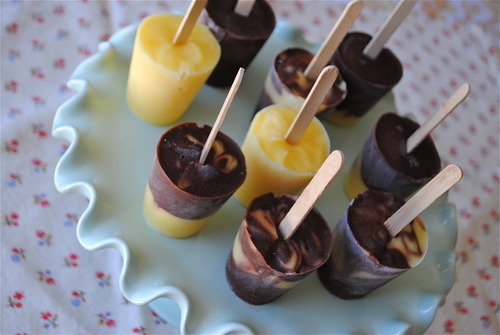 When frozen solid and ready to serve, simply cut the cup away from the pudding pop and serve. these were a hit at our house! I'm so glad you made them!